In response to users’ requirements, NoteBurner Apple Music Converter is upgraded to V2.0.9, which adds output to FLAC lossless format. 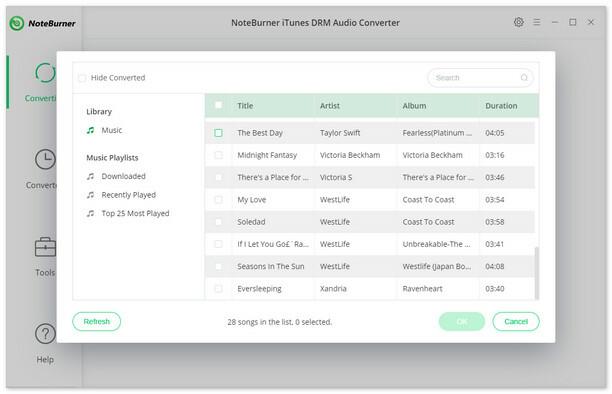 NoteBurner Apple Music Converter is a quite professional DRM audio converter, which can easily remove DRM from Apple Music files, M4A/M4B/AA/AAX audiobooks and M4P music and convert them to MP3, WAV or AAC format. Now the new version 2.0.9 of NoteBurner Apple Music Converter supports to convert Apple Music to FLAC lossless format. FLAC (Free Lossless Audio Codec) is a lossless musical file format that offers bit-perfect copies of CDs except at half the size. FLAC is similar to MP3, but lossless, meaning that audio is compressed in FLAC without any loss in quality; the quality of the FLAC file can be as excellent as CD Quality. Even though FLAC is still not so common to see on a default music player, but it is increasingly becoming more and more popular. Now, FLAC is compatible with many devices: computers, smartphones (including the iPhone -- with an app), portable music players (PMP) and hi-fi components. It is generally known that Apple Music songs are in M4P format (protected AAC format), which limits users listening to music from many aspects. To help people get rid of DRM restriction, many companies provide users with software to convert Apple Music to MP3 or WAV format for streaming. But technically, MP3 is lossy; if users convert Apple Music to MP3, the data will be lost from its original format. How about WAV? Actually, the WAV format is more popular, but its biggest problem is the converted file sizes is very large. By contrast, FLAC is undoubtedly the best option to balance size and quality. However, is there any program can convert Apple Music to FLAC? 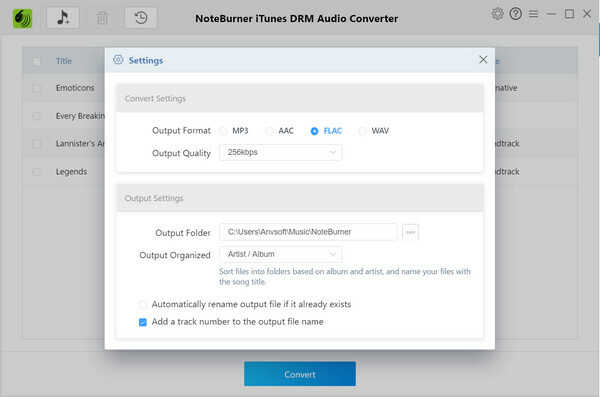 Luckily, if you want to convert Apple Music losslessly with half size of original file, NoteBurner Apple Music Converter will help you, it supports to output file to FLAC format with zero loss. The following is a detailed tutorial on how to convert Apple Music files to FLAC with the latest version of NoteBurner Apple Music Converter. Please download this useful tool on your Windows PC or Mac first before getting started. After the successful adding, the next one is choosing the output format according to your need. Clicking the button "setting", in the pop-up window, you can choose output path, quality, format. Click the frame of format, and choose "FLAC" format. Click the "Convert" button to start conversion. After conversion, click the "Output" button in the main interface or right click the file list and click "Show in Finder" to find the output DRM-free audio. With three simple steps, you can remove DRM from Apple Music files and convert Apple Music streams to FLAC lossless format. After converting, your music files are free from any restriction.